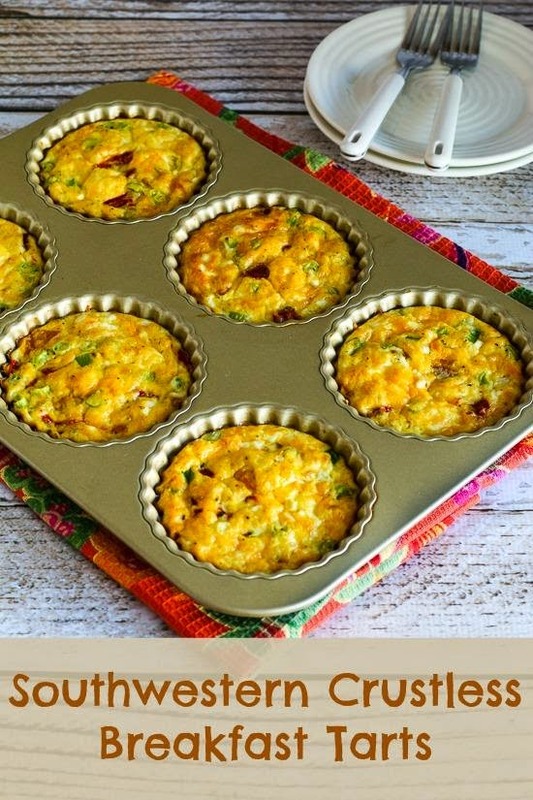 Southwestern Crustless Breakfast Tarts are perfect for a low-carb breakfast! You might remember a few months back how I bought a new tart pan that inspired me to create Crustless Breakfast Tarts with Mushrooms and Goat Cheese. Since then I've had fun experimenting with breakfast tart ideas, and these Southwestern Crustless Breakfast Tarts were an absolute winner. The tarts have roasted red and yellow peppers, green onions, a pinch of cumin, Spike Seasoning, Mexican blend cheese, and a little sour cream stirred into the egg for a creamy texture. I ate them with a dollop of sour cream and some salsa on top, and for me one of these made a perfect low-carb breakfast. If you don't have a tart pan like mine, you can make these in a Jumbo Muffin Pan for a thicker tart. The openings in my pan are about 4 inches across, so if your muffin cups are smaller you'll probably have to increase the baking time just a little. These Southwestern Crustless Breakfast Tarts reheat beautifully in the microwave, and I think this Meatless Monday recipe would be perfect any time of day.